There are several structures on GIRR Mountain Division and construction of new buildings is still ongoing. 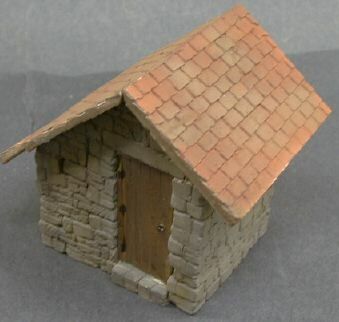 The sources of these buildings are varied, some are straight up kits and some are completely scratchbuilt, some are in between. They are shown in more or less the order in which they were built or acquired. The passenger station is a Playmobile kit. It is moderately detailed and selectively compressed, but overall it is a good kit. The parts are made of exceptionally heavy plastic and the kit can be assembled without any adhesive. There is a large hole in the back to allow children to play inside in doll house style. 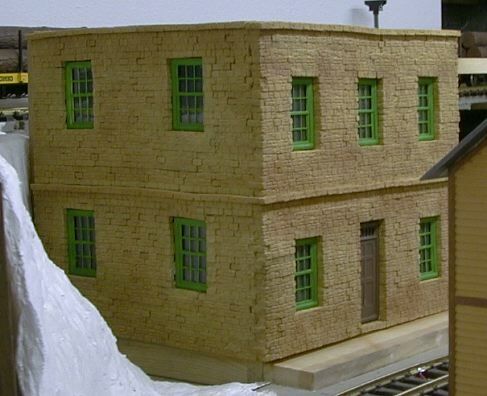 This is a freight depot made by ScanKit. I bought it for about $20 at a Queen Mary show many moons ago. There were several different types, but I've never seen any of them since. The kit is made of fairly light plastic parts and probably would not hold up outdoors. This is a plastic kit, from either Pola or Piko (I can't remember which). Saloons often did double duty in many small western towns. This one is the local red light district. 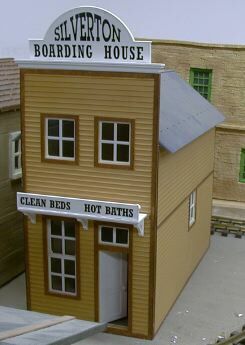 This kind of kit comes in pre colored heavy plastic and is often used out of doors. The two bay engine house is a Pola kit. It is made of exceptionally heavy plastic and comes pre painted and colored. 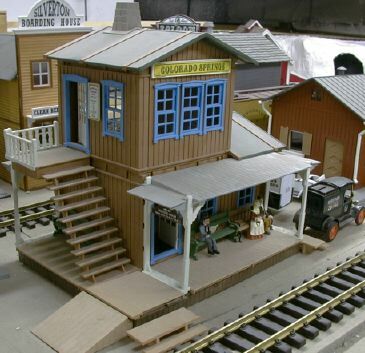 The style is somewhat European, but its close enough to represent an engine house on a US railroad. 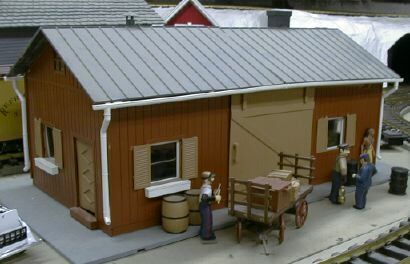 This kit is similar to the saloon, it is probably made by Pola. When I moved it to put the hotel next door, I found that it had a boarder. There was a mouse's nest inside. 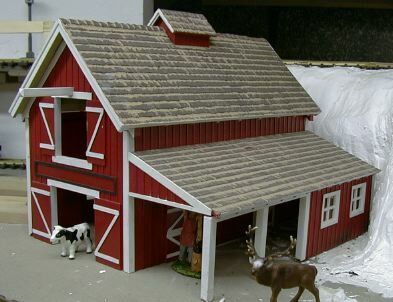 This barn is an AristoCraft fully assembled structure. What you see is what you get. I've done nothing to it yet. It is supposed to be a livery stable. This wooden shack was built by my son as a school project. 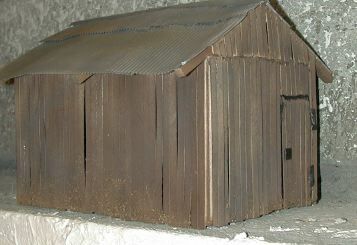 It was supposed to represent a German POW camp barrack. After its school service was over, it was transported to the GIRR Mountain Division for service as a MOW building. This coal bin is a JigStones starter project. 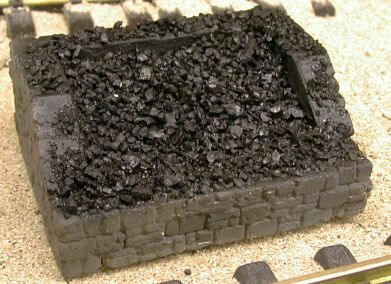 Since it was built, it has received an overcoat of genuine Welch coal. This building front is a bank constructed of 1:32 scale JigStones cast in plaster. 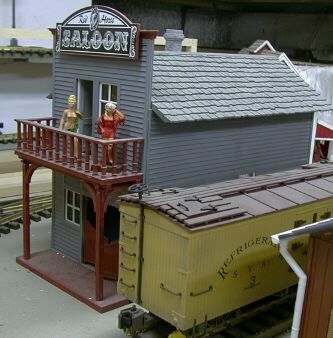 The structure is built on a lift out frame that allows access to the backside of the town portion of the layout. Eventually, the rest of the frame will be filled in with other building fronts. 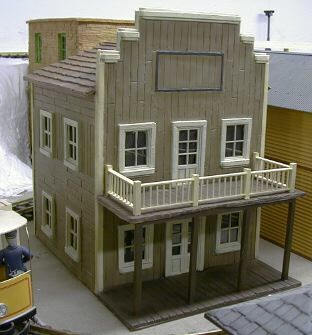 This is another JigStones starter project built to 1:32 scale. It will be used in the background (such as it is) to force perspective. This is a hotel made from a Precision Products PV (Plastic Veneer) sheet "kit." Calling this a kit is really stretching the definition of the word. I spent a period of 4 months working on it. The "kit" comes with five PV sheets, some instructions and a tube of glue. Past that, its a scratchbuild project. A core box must be fabricated from plywood (not supplied) and then the PV sheets must be trimmed and glued onto the box. The edges of each sheet don't join really well at the corners so that styrene strips (not supplied either) were used to cover the corners. Trimming the PV sheets is a lot of work if you want transparent windows as each individual pane must be cut out. Then the core box must be cut to match the windows. Clear styrene sheet (you guessed it, not supplied) is used to glaze the windows. For now black construction paper covers the inside so the hollow building interior is not visible. The balcony railing is all scratchbuilt from basswood (not supplied) and the balcony is supported by more basswood (also not supplied). I had to make a fixture to assemble the railing panels. The PV sheets were formed in gray styrene so after the whole ordeal of assembly, the whole thing had to be painted. This took a couple of hours due to all the masking required.